What do previous clients have to say? Here are just some of the happy comments we regularly receive. Thank you so much for adding such pleasure to our day. I know everyone had such a great time. Lasting memories for a lifetime. You're an awesome DJ and such a professional at your job. - Scott & Cindy D.
Jessica and I wanted to thank you for the wonderful evening of music and MC'ing you did at our wedding. Everyone had a great time and we really appreciated that you played our music. 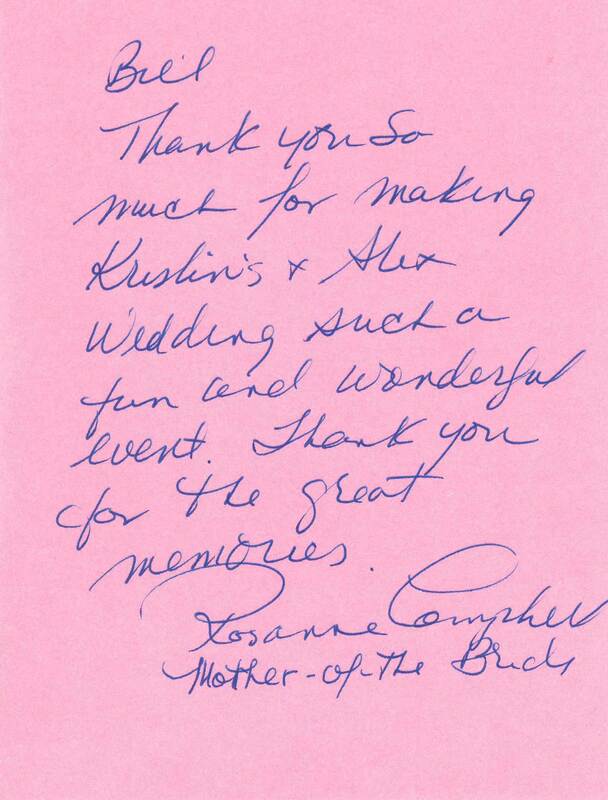 Your insight & experience helped the flow of the wedding & ensured a good time for all! We can't wait to need your service again. Thank you so much! You were wonderful to us & made the night! 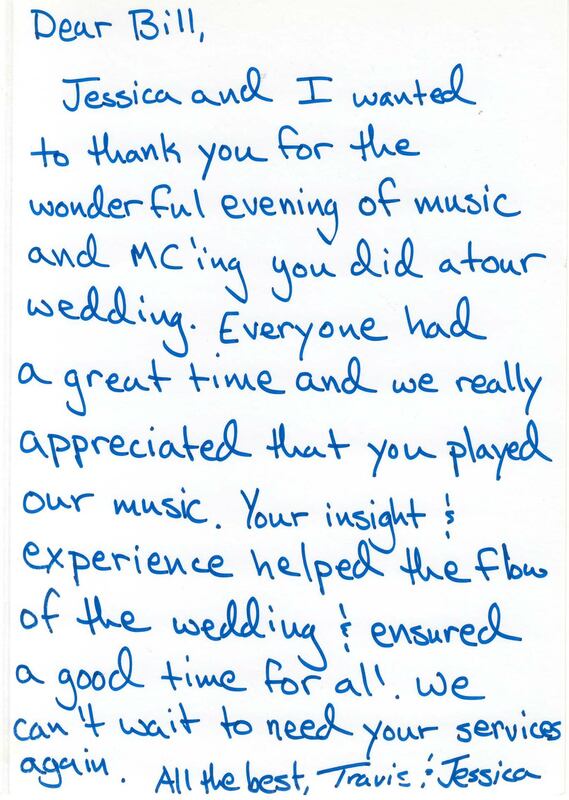 I was so happy with the music you played & appreciate your extra help with the ceremony music. You went above & beyond for us & we were so lucky to have secured you as our DJ. Thanks for making the night for us, our guests & family. You received rave reviews from all! - Krissy & Dan T.
...thank you for your amazing work! You truly helped to make our wedding day perfect! We both had so much fun at our wedding & you helped that happen! Thank you! - Andy & Erin M.
Thank you so much for making Kristin & Alex's Wedding such a fun and wonderful event. Thank you for the great memories. Thank you for all your hard work in making our wedding such a big success. Everyone had a great time on the dance floor and you did such an amazing job adjusting the music to make sure the dance floor was full! We are SO happy we chose you as our DJ. 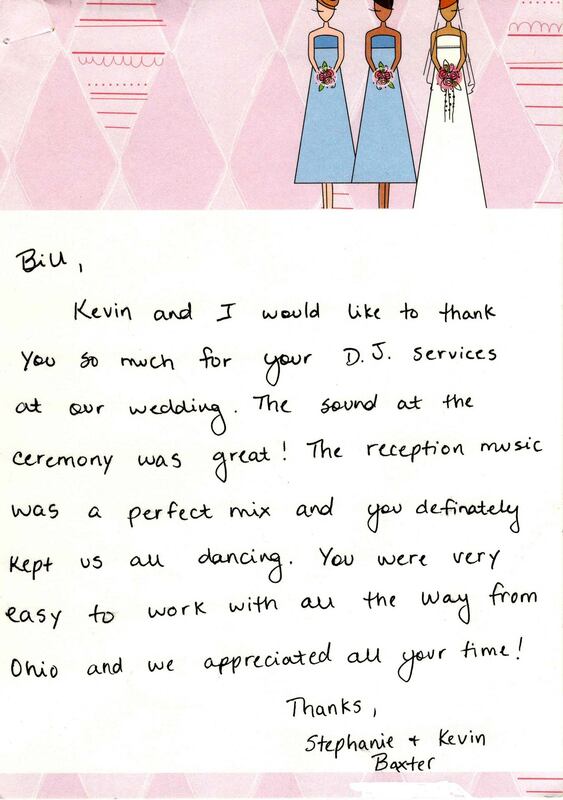 - Lara & Mat K.
Thank you SO very much for being our DJ at our wedding...We were very pleased with your service and I have been recommending you to other brides on TheKnot.com and to my co-workers...Thank you so much for keeping our wedding day running smooth and keeping us dancing! - Brook & Colin B. Thanks so much for helping to make our wedding reception so much fun. You did a great job with the little information we gave you and helped to keep everyone dancing. We'll be sure to recommend you to our friends! 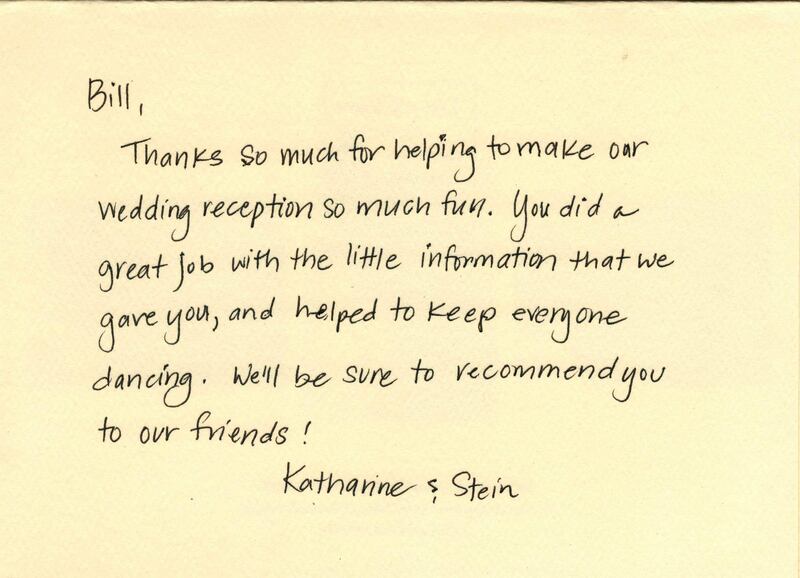 We would like to express our gratitude for the outstanding job you did at our wedding. Our schedule of events was really tight and you were able to keep everything on track. 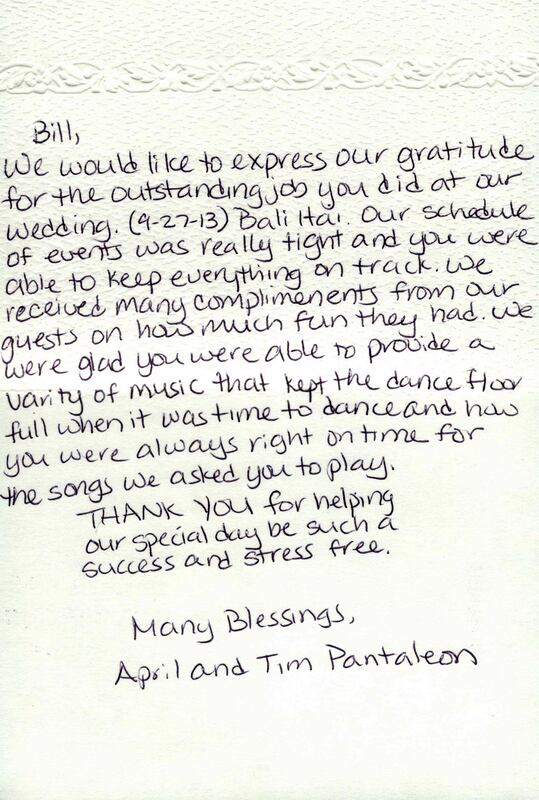 We received so many compliments from our guests on how much fun they had. 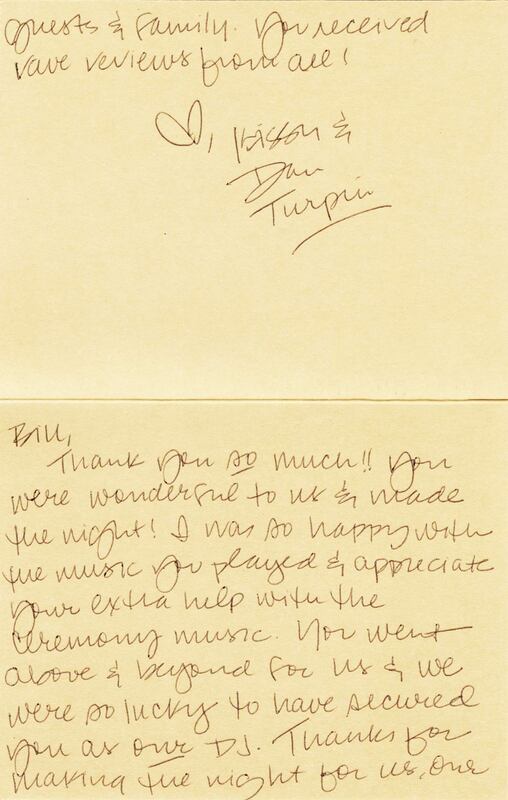 We were glad you were able to provide a variety of music that kept the dance floor full when it was time to dance and how you were always right on time for the songs we asked you to play. Thank you for helping our special day be such a success and stress free. 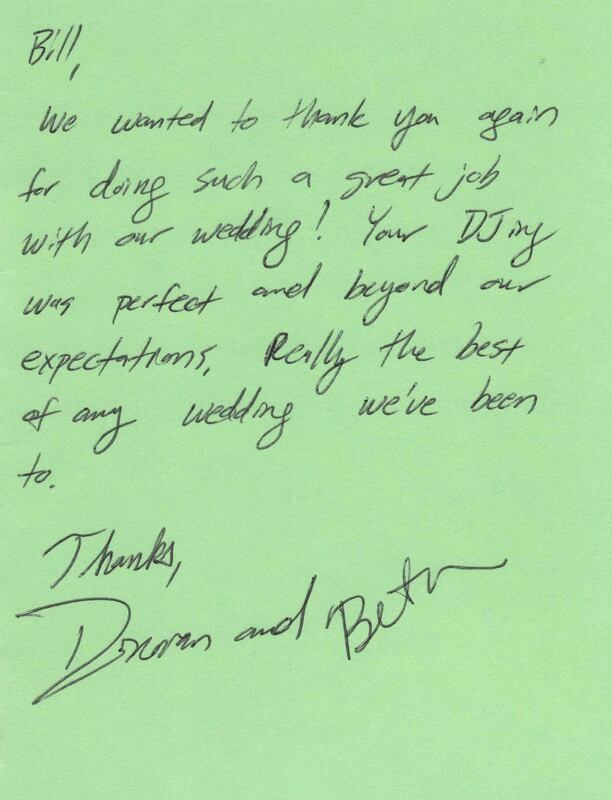 - April & Tim P.
We wanted to thank you again for doing such a great job with outr wedding! Your DJing was perfect and beyond our expectations. Really the best of any wedding we've been to. ...thanks fo you for your excellent performance as M.C. at our wedding. 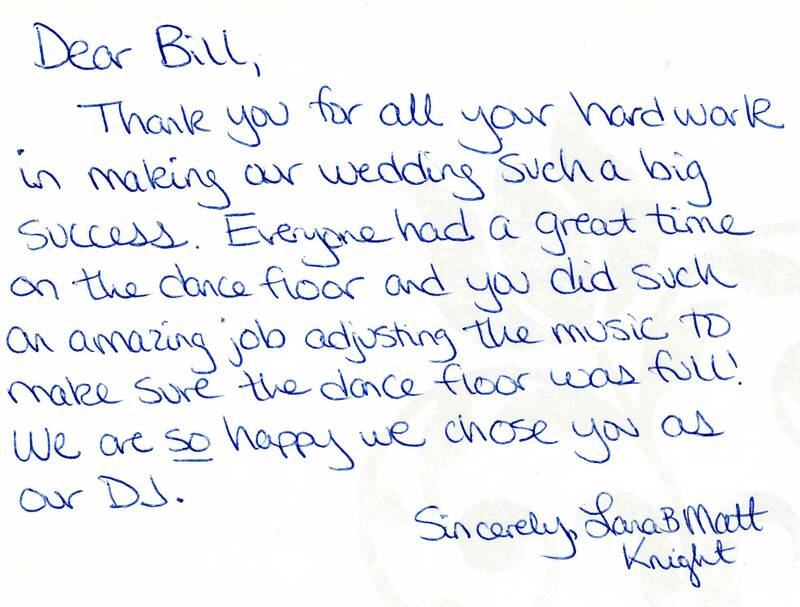 We were absolutely delighted with your DJ selections and received so many compliments from our family and friends. 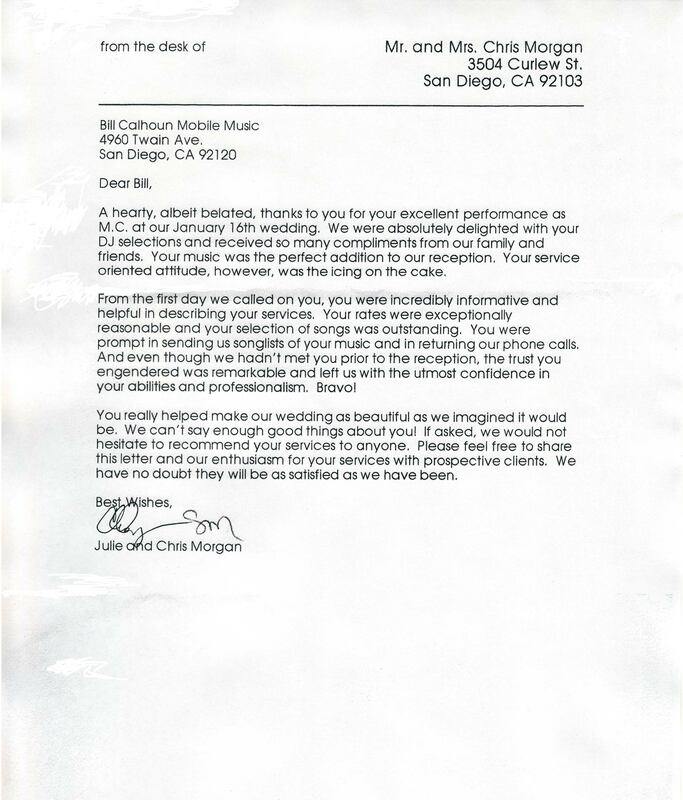 Your music was the perfect addition to our reception. 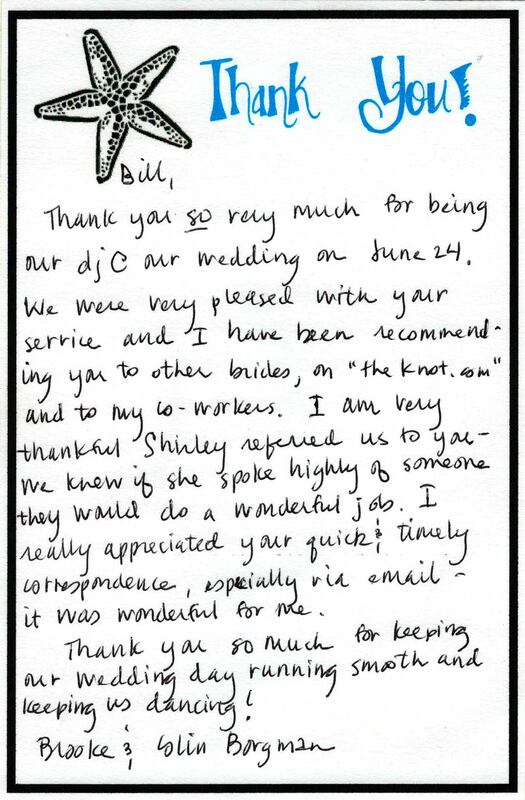 Your service-oriented attitude, however, was the icing on the cake...You really helped make our wedding as beautiful as we imagined it would be.